Business mogul Ratan Tata, who heads a conglomerate comprising nearly 100 companies, said his successor would be in place by middle of the year and his step-brother was one of the contenders. "I hope that by the first half of this year, we'll be able to define a suitable candidate with whom one can overlap for a short period of time before I move on," Ratan Tata said in an interview to CNN International's Talk Asia programme. 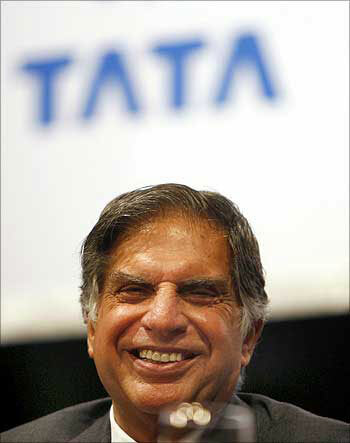 Image: Ratan Tata heads nearly 100 companies. The 73-year old Tata is scheduled to retire as Chairman of Tata Sons in December 2012, when he turns 75, and a search panel was formed in August last year to find his successor. Asked what were the chances of his successor not having Tata as the last name, the industrialist said that he would not like to comment on that. "My step-brother is one of the candidates that is being considered and I don't think it's my lot to, to say whether it's fifty per cent, or ninety per cent or ten percent so...," he added. Image: Noel Tata heads Trent. 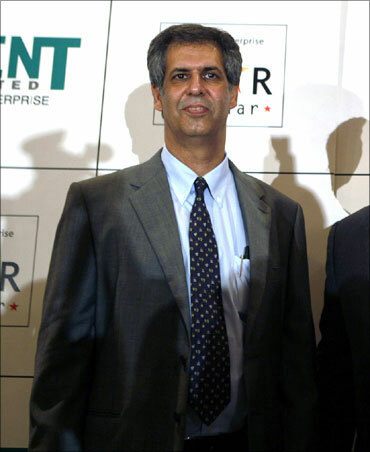 He was referring to 53-year old Noel Tata, Ratan Tata's half-brother and a senior group executive. Noel is chairman of the group's retail arm Trent and also managing director of Tata International, a trading company. Tata, who has been heading the group as Chairman of its parent company Tata Sons since 1991 and had joined the group in 1962, said that it had been an exciting time for him. 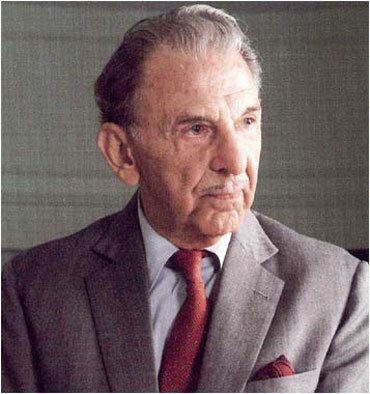 Image: J R D Tata, the longest serving chairman of the Tata Group. Asked about who would succeed him, Tata said: "There is a committee that's been established that committee is mandated with looking at internal candidates, external candidates, Indian expatriates, they have a short list of people who they're examining today and who they are meeting. "I've stayed away from that committee because I think that committee should operate independently without the force of someone who is looking over their shoulder and I hope that by first half of this year, we'll be able to define a suitable candidate with who one can overlap for a short period of time before I move away," he added. 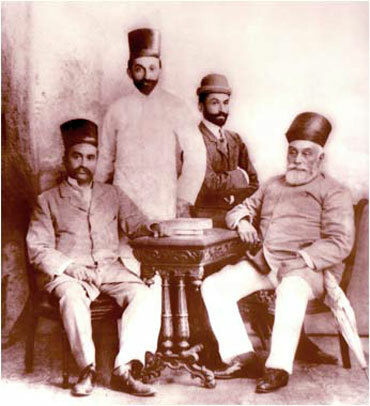 Image: J N Tata (sitting right to left), the founder of the Tata Group; Sir Dorabji Tata, (standing right to left); the elder son of J N Tata, Sir Ratan Tata, his younger brother and R D Tata, father of JRD Tata. When asked whether the finalisation of his successor could cause a family strife, Tata said: "No, I don't think it, it may. I have no way to know." Talking about the legacy he wanted to leave behind, Tata said: "I think what I would like to do is to leave behind a sustainable entity of a set of companies that operate in an exemplary manner in terms of ethics, values and continue what our ancestors left behind. "Not my legacy alone but a continuation of the legacy that extends over the last over a hundred years. 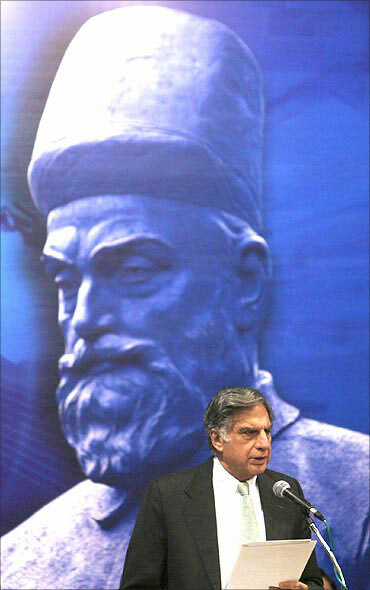 Image: Ratan Tata speaks in front of a portrait of Tata Group founder Jamsetji Nusserwanji Tata. "I hope my successor will be as committed to that as I have tried to be," he added. He went on to say that his only regret was not being 20 years younger in age, but maintained that he did not crave to stay on at the top of the country's biggest corporate empire. Speaking about the business environment in India, Tata said his group has succeeded in growing without indulging in things like kockbacks and bribes. 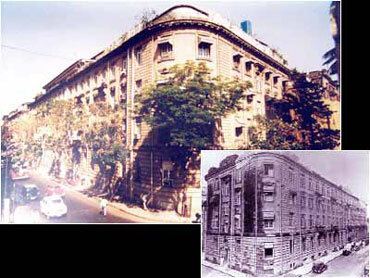 Image: Bombay House, the headquarters of the Tata Group (1926). "I would say that we could have grown faster and could have prospered more as a group but we have never, we have never in fact partaken in this kind of activity," he added. Asked whether anyone in his company or any lobbyist did anything inappropriate or illegal, he added: "I can say with my hand to my heart we have not in fact partaken in any clandestine activity. "I am hopeful that the investigations that are underway will truthfully bring out the position and that the truth will be on the table before too long." 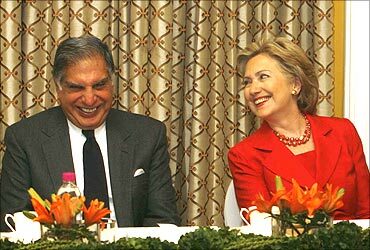 Image: US Secretary of State Hillary Clinton and Ratan Tata at a meeting. Speaking further about the corruption issue, he added: "I think what's happening now in terms of things being before the courts, I hope will put things in the right perspective. I hope that it doesn't become a nation of scandals and allegations as they are. "I think more importantly the media has to be more circumspect and be careful they don't malign or allege or convict people before they've had a fair trial," he added. Asked whether it was hard to be an honest businessman in India, Tata said: "I think there are many honest businessmen, I think there are many that bend. I'm happy that I have not bent, not that I am dishonest, that I have not bent." 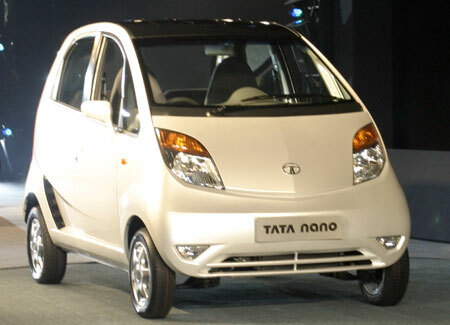 Image: Tata Motors is just one of Tata's companies. Besides the group's promoter company Tata Sons, Ratan Tata is Chairman of major group companies like Tata Motors, Tata Steel, Tata Consultancy Services, Tata Power, Tata Global Beverages, Tata Chemicals, Indian Hotels and Tata Teleservices. During his tenure, the group's revenues have grown nearly 12-fold, totalling $67.4 billion in 2009-10. He also serves on the boards of Fiat SpA and Alcoa and is also on the international advisory boards of Mitsubishi Corporation, the American International Group, JP Morgan Chase, Rolls Royce, Temasek Holdings and the Monetary Authority of Singapore. 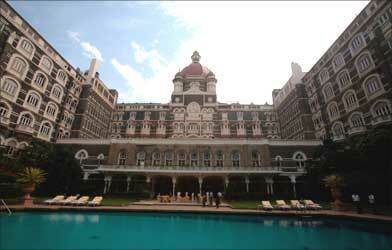 Image: Tatas also own The Indian Hotels Company. Indians as global CEOs: Is it a real triumph? Warren Buffett is 80, wants to work past 100!